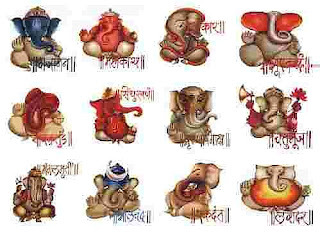 Well … and that’s how I feel …: Jai Ganesha - My obeisance ! Jai Ganesha - My obeisance ! Anyway, here's my bit to pay obeisance to the most 'people-friendly' God.... Lord Ganesha.. a.k.a. Ganapati. I guess, he's the most popular Indian God outside of India. From the many foreigners I've met, they seem fascinated at the concept of the 'Elephant God'. Also, every time anyone would recite the famous Ganesh Mantra, I always wondered what that meant, so I went and found out - and here's the translation for those who are also curious. "Vakratunda Mahaakaaya Suryakotee Sama Prabha Nirvighnam kuru mey Deva Sarva kaaryeshu Sarvadaa"
"O Lord Ganesha of Large body, curved trunk, With the brilliance of a million suns, Please make all my work free of obstacles, always." The image is, by far, one of my favourite pics of Ganesha. May Lord Ganesha give you all, the strength to face your obstacles better .. and if you think that He's gonna remove them you .. well think again .. He only helps those who help themselves, right? So while you keep PRAYING, make sure you are also DOING the right things - that way you stand a BETTER chance of beating the odds against you..